The primary purpose of the November 7th bond proposal is to build and update school facilities for this generation and the next. Our buildings are over 60 years old; we spend approximately $1 million/year more on maintenance than our neighboring districts. We have over $24 million in critical needs. It’s time we do more than patch/repair. The goals are to enhance student safety and security, increase efficiency to lower costs, upgrade technology and infrastructure, and purchase buses when they reach the end of their useful lives. This will improve the education of all students and district quality for all residents. This bond, now approved by voters, will assure our facilities operate efficiently, match current and projected student enrollment, and are on par with neighboring school districts. ¨ Construction of a new elementary and early childhood school to house current Peck Elementary students and youngsters in the Early Childhood Center (ECC) program, located behind Center Line High School. ¨ Renovations and new construction at the Early Childhood Center (formerly Ladd Elementary). Roose Elementary students will be relocated to this “new Roose” in 2021. ¨ Improvements to Crothers Elementary, including the addition of a new cafeteria and gym (2023). ¨ Renovations at Center Line High School and Wolfe Middle School (including roof repairs, installation of new technology, and upgrades to the CLHS auditorium and pool). ¨ Relocation of administration to Wolfe Middle School and demolition of Follbaum Administration Building. ¨ Roof replacements and other improvements at Peck Elementary. When completed, this school will be used to house the Homeschool Partnership and Academy 21 students beginning in 2023. ¨ Replacement of school buses as they reach the end of their useful lives. The $53.95 million, 25-year bond proposal ill increase the current tax rate by 4.9 mills, or about $4/week for a person living in a $80,000 home. If property values rise, we collect fewer mills. If property values fall, the mills increase but the amount that each taxpayer pays will remain fairly stable based on the 4.9 mills calculation (see tax calculator). The bond affects every CLPS student and every CLPS school and will help us catch up with neighboring districts. Center Line Schools has the lowest bond debt in Macomb County at just over $16.6 million; Warren Woods has $47 million, Fitzgerald $68.6 million, and Van Dyke $79.6 million. 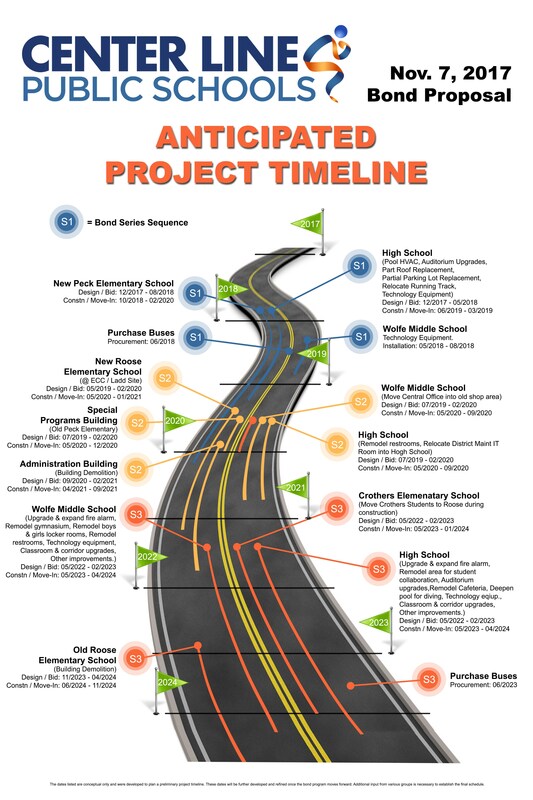 All bond proposal projects are designed to reflect positively on property values and the community’s positive reputation, and are aligned with the district’s strategic improvement plan. All bond revenue stays here in the CLPS district. None of it can go to salaries. You can register to vote for this election up until Oct. 10. Registering to vote does not place you on a list for jury duty; potential jurors are selected randomly from the State of Michigan Driver's License list and Personal Identification Cardholder list. Absentee ballots will be available September 23.